Wabash County (pop. 32,888) is east of Miami County. 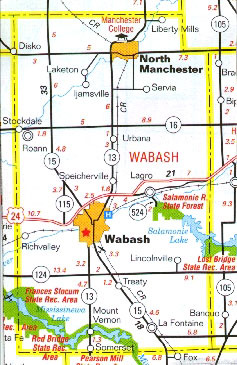 The only other Wabash County is in Illinois. The county was named for the Wabash River, Indiana’s longest river. 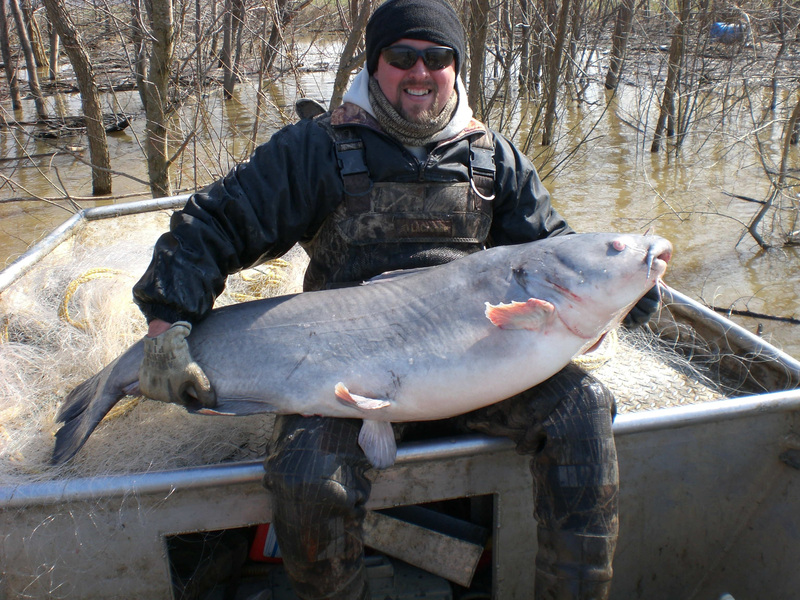 The word is an English spelling of a French version (“Ouabache”) of the Indian name for the river – “Wabashike,” meaning the “pure white” of the limestone river bottom. 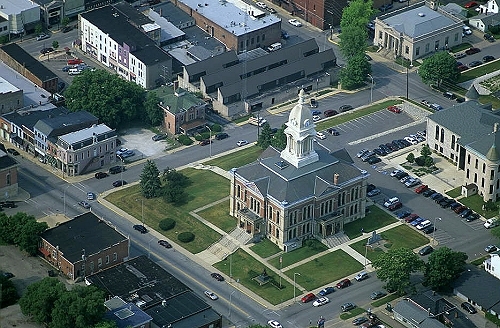 The county seat of Wabash County is the city of Wabash (pop. 10,666). Wabash reached its peak population of 13,379 in 1970. In 1880, Wabash became “The First Electrically Lighted City in the World,” when four huge carbon-arc lights were placed on top of the courthouse and lit the entire block. Industrialist Mark C. Honeywell (1874-1964) founded Honeywell, Inc., in Wabash and was its first president and CEO. 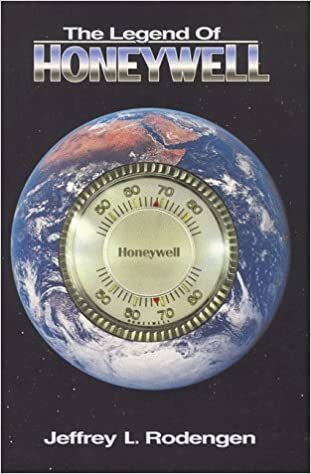 Honeywell International, Inc., is now based in New Jersey. The Honeywell Center (1952) in Wabash, operated by the Honeywell Foundation, has a theater, restaurant, art gallery, and meeting rooms. The Eagles Theatre in Wabash dates from 1906. It was purchased and restored by the Honeywell Foundation in 2010. Wabash also has a drive-in movie theater – the 13-24 Drive-In, named for two highways that intersect nearby. Country singer Crystal Gayle (younger sister of Loretta Lynn) grew up in Wabash and graduated from Wabash High School. The town of North Manchester (pop. 6,112), north of Wabash, is the home of Manchester University – a liberal arts school affiliated with the Church of the Brethren. 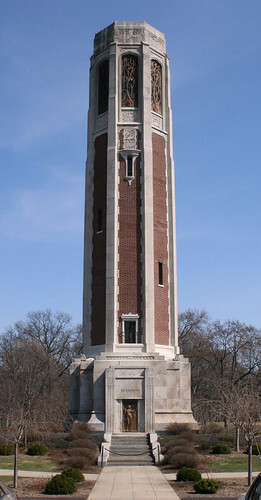 The 110-foot Peabody Memorial Tower (1937) is on the grounds of the Peabody Retirement Community in North Manchester. 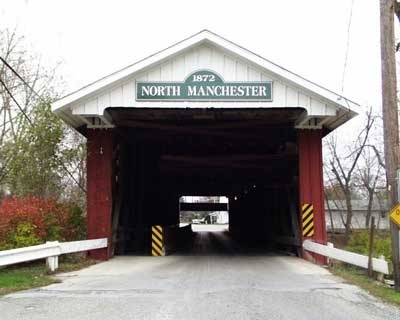 Wabash County has two historic covered bridges, both dating from 1872. This entry was posted in Indiana and tagged Crystal Gayle, Honeywell, Manchester University, North Manchester, Wabash.